St. Patrick’s Seminary and Catholic parishes are participating in NanoFarms USA’s pilot project. The grounds of St. Patrick’s Seminary & University boast row upon row of broccoli, Swiss chard, kale, and strawberries this spring, products of a new parish Catholic workers cooperative created in a venture among the seminary, Guadalupe Associates, and the parish of St. Francis of Assisi, East Palo Alto. “I was actually surprised we yielded so much the first year,” said Sulpician Father Gladstone Stevens, rector of the seminary who, along with San Francisco Archbishop Salvatore J. Cordileone, approved the use of seminary grounds to grow the crops as part of NanoFarms USA’s pilot project. The website is nanofarms.com. NanoFarms’ primary product for sale is small, sustainable produce gardens installed for homeowners, with the option of ongoing maintenance by NanoFarms on a weekly or monthly basis, said Brendan Ford, NanoFarms manager. The cost for an installed 8-by-5 foot garden starts at $899. NanoFarms’ planned structure is to franchise to parish worker cooperatives—and the first one is the St. Francis of Assisi East Palo Alto co-op. “I had other jobs and I earned good money but I think none is so beautiful as this job,” said St. Francis of Assisi parishioner and co-op member Ernesto Jasso, who was selling produce grown at the seminary to St. Charles School parents and grandparents after school April 20. Jasso and his wife Marcella, who lead their parish respect life group, are among five members of the co-op. Produce will also be sold regularly at St. Pius, St. Denis, and Our Lady of Mount Carmel parishes. But the primary product of the co-op will be installing gardens on a fee basis, mostly at residences. NanoFarms is a Catholic faith-based workers’ cooperative along the lines of a very successful Spanish workers’ cooperative Mondragon, now the 10th-largest corporation in Spain, which was founded in 1941 by Basque priest Father José María Arizmendiarrieta Madariaga, Ford said. The idea is to create income and employment for low-income people suffering from the skyrocketing cost of living in the Bay Area, said Father Lawrence Goode, pastor of St. Francis of Assisi Parish in East Palo Alto, where the poor, mostly Latino city is squeezed alongside wealthy Silicon Valley enclaves. “My experience is that if people want to improve they have to have an economic source of well-being. This is a small attempt at that. It is doing it from a spiritual basis,” said Father Schultze, who brainstormed with Father Goode and Guadalupe Associates/Ignatius Press founder [and Catholic World Report publisher] Jesuit Father Joseph Fessio before coming up with NanoFarms. 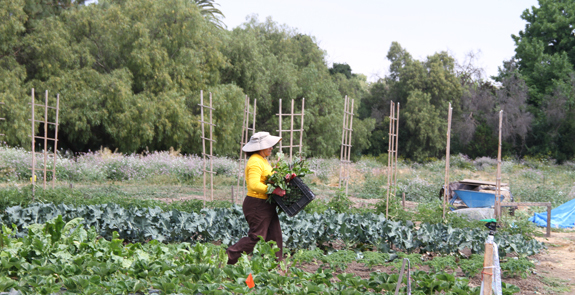 The gardens at the seminary are a pilot project and a training ground for the co-op members. The gardens, now about 10,000 square feet, will continue, supplying produce for sale and for the seminarians. Father Stevens envisions seminarians taking the techniques and philosophy of NanoFarms to their assignments as priests. Guadalupe Associates is funding the startup costs of NanoFarms, including paying Ford’s salary and for training in the specialized farming techniques for Ernesto and Marcella Jasso, who are sharing what they learn with the other members of the St. Francis co-op, Ford said. NanoFarms is using aspects of the “biointensive” farming method, as taught by John Jeavons of Grow Biointensive, because of its focus on sustainability in agriculture, Ford said. However, NanoFarms is not using all of his methods. The intense use of resources is well-suited to semi-arid California, particularly during this time of drought because much less water is used, said Ford. In addition, at the seminary, well water is used. “The largest farm in the world is thousands of acres, one billionth of that is several hundred feet. A NanoFarm,” Father Fessio said. The NanoFarms USA project at the archdiocesan seminary and St. Francis of Assisi Parish in East Palo Alto is implementing the Catholic social justice theory of distributism envisioned by thinkers G.K. Chesterton and Hilaire Belloc in the early-20th century, Father Schultze said. Distributism places the family at the center, extolls family homeownership, and includes the idea of co-ops where workers own the means of production and share in the profits within the framework of a capitalist economic system. It comes out of Pope Leo XIII’s encyclical Rerum Novarum, released in 1891 in response to the inhumanity of unregulated 19th-century capitalism, the advent of socialism and atheistic Marxism, and the rise of trade unions. The encyclical is the foundation of modern Catholic social justice thought. NanoFarms founders, including Father Fessio, hope for a national movement of parish-based, worker-owned cooperatives embodying the economics and Catholic spirituality of G.K. Chesterton. Already, Lighthouse Catholic Media in Chicago is helping develop NanoFarms USA there, Father Fessio said. This article first appeared at Catholic San Francisco and is republished here with permission. Valerie Schmalz is a journalist for Catholic San Francisco, the official newspaper of the Archdiocese of San Francisco.